There is a piece of great news for Bangladeshi musicians and music aficionados, particularly those of the rock community. The infectious energy of our favourite drummer, Nafeez Al Amin, of the band Arbovirus has crossed the borders and infected the global arena. US based company Soultone Cymbals had recently endorsed Nafeez. Recently, we caught up with him where he shared all about it. We also got to know some interesting facts from him. 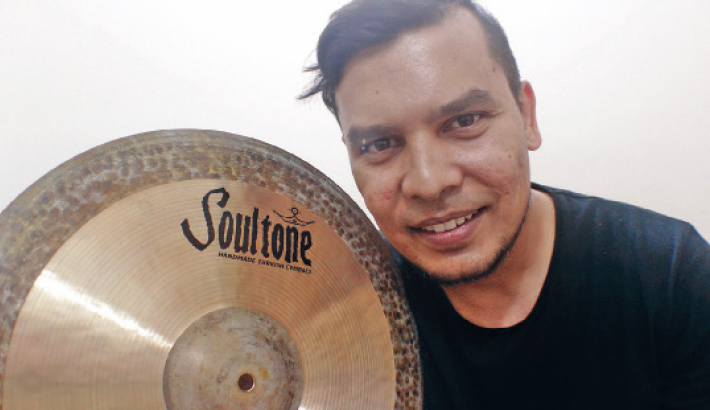 “Dogpatch Music is the only distributor of Soultone Cymbals in Bangladesh. I was talking to them one day about random things related life and so on. When they suddenly asked me if I would like to be their ambassador, I was surprised!” Dogpatch Music was looking for a good drummer with a great fan base. Nafeez with his exceptional skills matched all the criteria and, after a few days of observation, he was officially endorsed on March 12. “I am very honoured to have this opportunity. Soultone Cymbals is a great brand that is well-known worldwide. It so happened that the owner was unhappy with the sound of other cymbals, so he decided to create his own brand in 2003. It has been a superior brand ever since for its premium sound, feel and performance.” Dogpatch Music is one of the exclusive authorized dealers and distributors for Bangladesh not just for Soultone Cymbals but other renowned brands too such as Tokai guitars. They offer the best quality instruments in Bangladesh at an affordable rate. All in all, the endorsement was a sweet one, as if a marriage made in heaven. Fans are extremely proud of Nafeez for it.